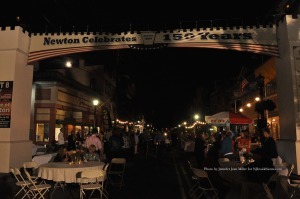 Visitors to A Taste of Newton enter through the archway to the festivities on Spring Street. Photo by Jennifer Jean Miller. 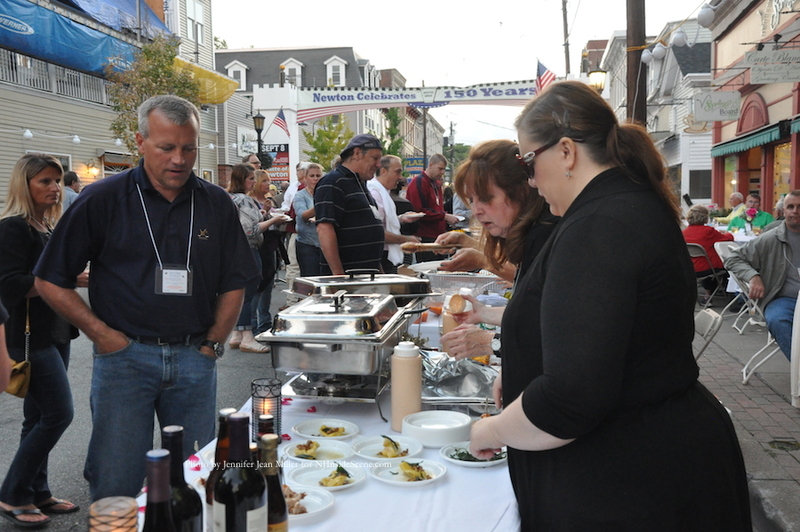 NEWTON, NJ – Several hundred people gathered on Monday, September 8 in Newton’s Downtown to enjoy the cuisine of approximately 25 restaurants and other food purveyors, while raising funds for local scholarships. 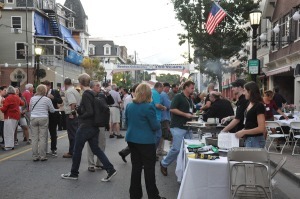 A presentation of the Greater Newton Chamber of Commerce, in its thirteenth year, when A Taste of Newton annually takes place, Spring Street shuts down for motor vehicle traffic, and in its place, restaurants set up stations with specialty dishes, while attendees mingle and can sit at tables set up along each side of Spring Street. 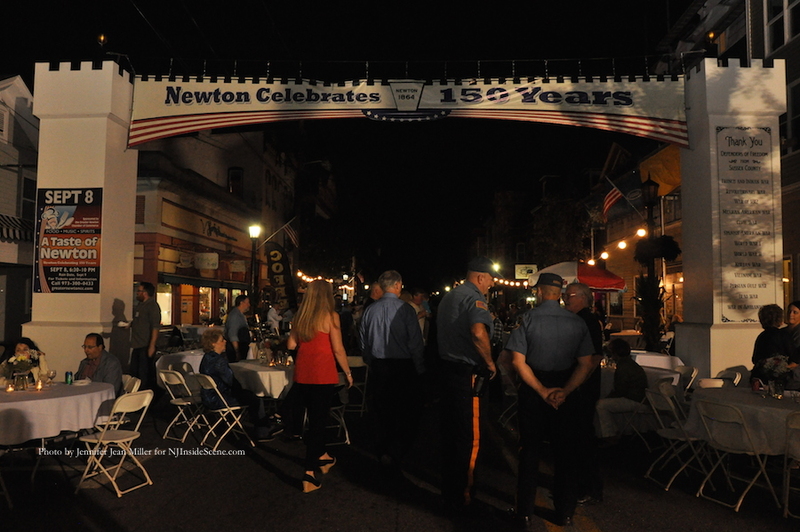 “It’s a beautiful night, great crowd, and wonderful food,” said Nancy Woods, Executive Director of the Greater Newton Chamber of Commerce. 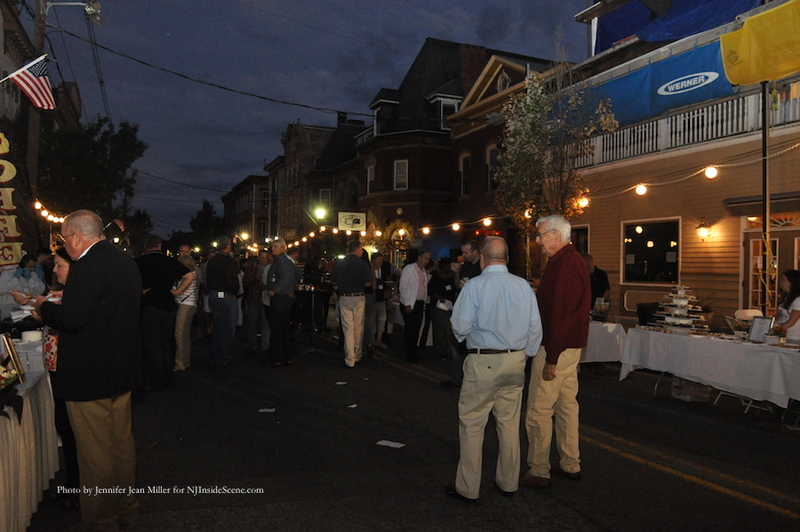 Attendees arrive before dark and check out the offerings on Spring Street. Photo by Jennifer Jean Miller. Spring Street lights up for the latter part of the event. Photo by Jennifer Jean Miller. 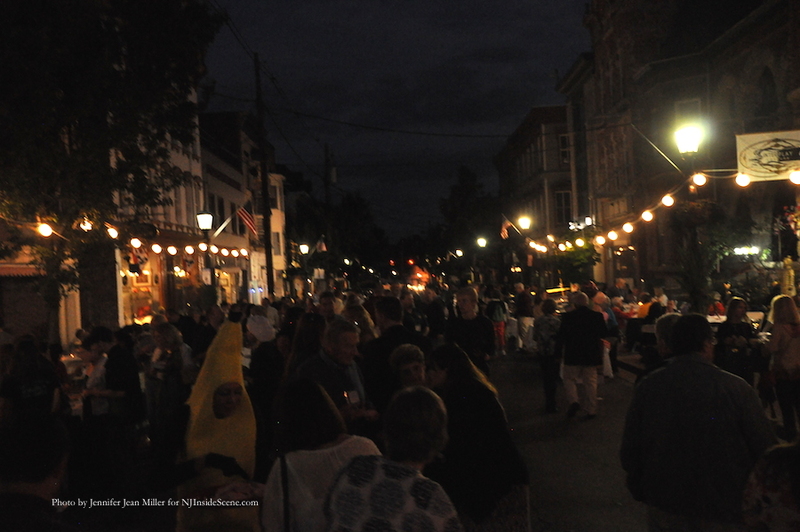 Dusk falls on Spring Street. Photo by Jennifer Jean Miller. 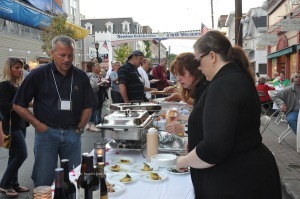 Woods said the scholarship monies raised include a culinary scholarship, and benefit students at the Sussex County Technical School, Newton High School, and Kittatinny Regional High School. Participating establishments included: The Chatterbox Drive-In, Cliff’s Homemade Ice Cream, Dre’s, Divinely Dolce, Edible Arrangements, Forno Italiano, Georges Wine & Gourmet Gallery, Happy Wok Chinese Restaurant, Hayek’s Market, Hummingbird House, Krave Café & Caterers, Krogh’s Restaurant & Brew Pub, Lafayette House, Lucca’s Wood Fired Pizza, O’Reilly’s Pub & Grill, The Pizza Bistro, Romancing Desserts, Selda, Stadium Bar & Grill, Texas Smoke BBQ, Thai Nam Phet II, The County Seat, The Table, Trinity Lounge, and Tuscany Bistro. 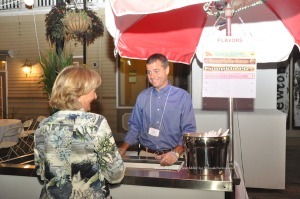 Establishments offer a range of cuisine to try. Photo by Jennifer Jean Miller. 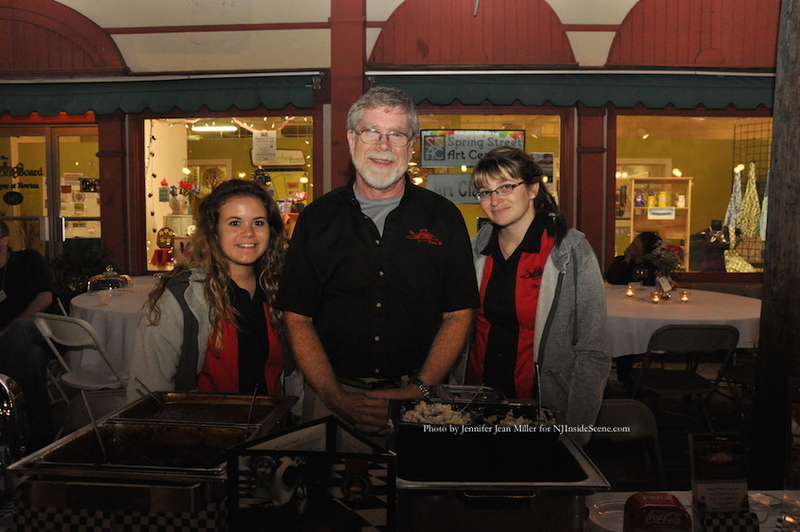 Representatives from The Chatterbox Drive-In offered Cranberry Chicken Salad, Pulled Barbecue Pork, and Baked Beans. 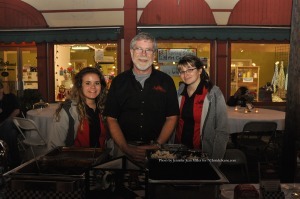 The restaurant’s owner Don Hall (center) is assisted by Jenna Winkeleman (left) and Stephanie Cooke (right). Photo by Jennifer Jean Miller. Brittany and Mike Collins of Villa Capri dished out Italian specialties. Photo by Jennifer Jean Miller. It’s always a treat to stop by to Cliff’s Homemade Ice Cream, whether one asks owner Peter Freund for Butter Bing, Peanut Butter Smores, Pumpkin Pie, or Raspberry Cheesecake Ice Cream. Photo by Jennifer Jean Miller. 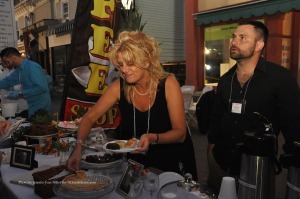 Vangie Rochelle from The Table serves up a piece of pie. Photo by Jennifer Jean Miller. Cranberry Chicken Salad, Pulled Barbecue Pork, Baked Beans (from The Chatterbox), Wild Boar (from The County Seat), Butternut Squash Soup (from The Pizza Bistro), Chicken Pot Pie (from O’Reilly’s), Chicken and Mushroom Tortellini in a Cream Sauce (Forno Italiano), Bourbon Pecan Bread Pudding in a Jameson Crème Anglaise (Trinity), and Raspberry Cheesecake Ice Cream (Cliff’s Homemade Ice Cream), were among the many items the attendees could indulge in. Dana Mooney and Andy Berardinelli stop for a photo at the event. Photo by Jennifer Jean Miller. 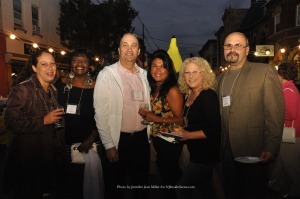 Friends joined Desiree and Tony Torre (second and third from left) for a photo. Photo by Jennifer Jean Miller. 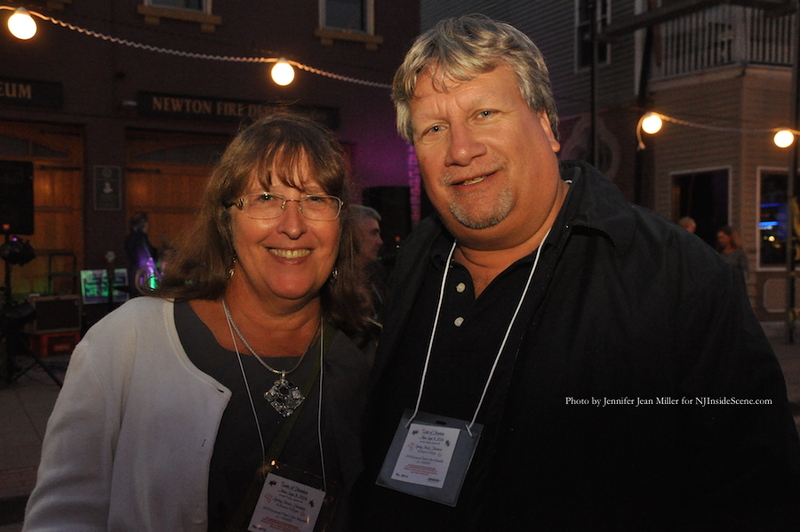 Harry Kaplan and Sheila Hughes with the festivities in the background. Photo by Jennifer Jean Miller. 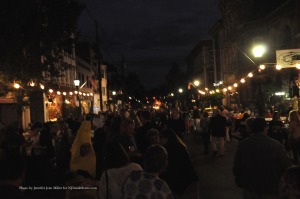 During the evening as guests celebrated in the comfortable temperatures, as the skies faded to dar and the full moon rose, the Liz Nordstrom Band provided musical entertainment. 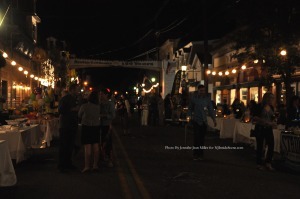 Lights twinkle along Spring Street. Photo by Jennifer Jean Miller. The moon shines over Spring Street onto A Taste of Newton. Photo by Jennifer Jean Miller. While guests were departing, many learned about another upcoming similar fundraising event, the Waterloo Village Harvest Moon Festival, on Thursday October 9, from 6:30 p.m. to 9:00 p.m., which features fine cuisine from many area eateries. 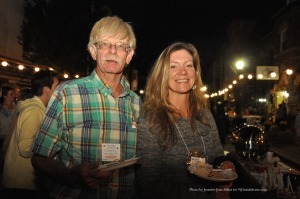 The Friends of Waterloo Village, a 501(c)(3) non-profit group, will be holding the fourth annual event, which includes food and beverage sampling and a silent auction, to benefit the Waterloo Restoration Project. 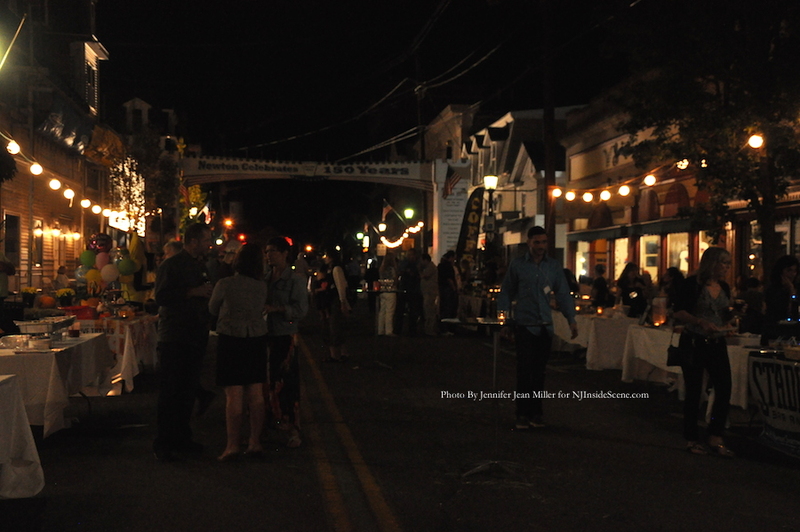 Stay on the scene with NJInsideScene.com, and follow our coverage of many events like this one. Click here to follow us on Facebook.